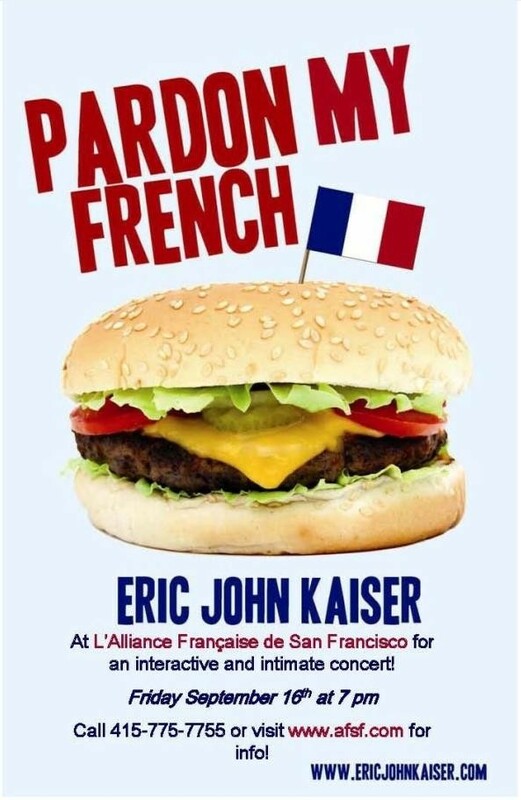 Wanna sing along French Classics with musician Eric John Kaiser? The Portland-based, Parisian-born artist Eric John Kaiser is playing an intimate concert at the Alliance Francaise of San Francisco, tonight at 7 p.m. Lyrics of classics French songs such as Edith Piaf, Charles Aznavour or Jacques Brel will be handed out for people to sing along. He will sing more contemporary songs, including some of his own from his two albums. His musical style is made of a mix of modern pop-rock with a hint of rock, hip-hop & reggae influences wrapped in sophisticated French lyrics. Kaiser, also known as “Portland’s French Troubadour” left the French Capital three years ago to settle in Portland to focus on his creative aspirations. With over 350 performances under his belt, Kaiser has toured extensively in France and Northern America. Working closely with local cultural organizations, the French Troubadour has come to the Bay Area since 2008, playing for the Fete de la Musique or World Music Day and more recently sang at the De Young Museum as part of his “Pardon my French” tour. To get a grasp of this talent, check out this live video of one of his concert in Paris. But the singer, songwriter, with a background in Journalism and documentary filmmaking doesn’t stop here. According to his blog, he recently entered the world of music producing. He produced the first record of a talented young musician: Kory Queen, “Waitin’ for a Train”, which came out in June. And for tonight, it’s $10 for non-members, and see below for the map.